Democracy entail free speech, freedom to associate but democracy does not condone mediocrity and deception. Much as we appreciate the number of civil society organizations in Malawi but we cannot and will not watch and allow deceptive and cheating views and opinions from them. Siding with any party or individual is a norm and concept of democracy in any open society but Malawi has a problem with the doctrine of truth and transparent thinking. Civil Society Organizations are welcome and their contributions towards a better Malawi is what democracy preach but when there are CSOs whose ideologies and objectives are to back mediocre and deception is where the Utopian and many sane citizens are against. Civil Society Organizations are not opposition parties that must use political tantrums. Our duty is to follow the truth. In other words ours is jurisdiction and jurisprudence. For 4 years deputy president Saulos Chilima has been performing his duties so has been the presidential advisor for safe motherhood who happen to be sister in law of president Peter Mutharika and former first lady Callista Mutharika. In your petition you are stressing that for 4 years madam Callista Mutharika has not been in office to execute her duties and being a state funded organization you know and have observed this but you went quite. Just because former first lady has exercise her democratic right to endorse Saulos Chilima who happens to be the vice president of the party that president Peter Mutharika leads is wrong and has to be perused and condemned to the point of asking these two to return all salaries and benefits they have received in four years. Are you comrades in Forum for National Development (FND) sane enough? I recommend all of you travel to Zambia or buy the new movie “Black Panther” and get to learn what it means to be loyal to the country or position not an individual. It is obvious that you are highlighting the matter because these two seems to you are enemies of Peter Mutharika not of state. Democracy demands free will, and free speech as well as free thinking. For Saulos Chilima and Callista Mutharika to have opposing views against the president whose popularity is waning and fading due to rampant corruption and state looting that is spiced by nepotism and favouritism, you have no moral ground to condemn or despise them. Your attitude and actions shows that you ignore and sideline the procedures of employment as well as constitutional obligations of Saulos Chilima as a deputy president. You were around as from 2010 when Bingu Wa Mutharika sacked his deputy Joyce Banda but failed to strip her off the vice presidency of the state and government. There is no way Saulos Chilima can be fired or fire himself till new elections are held in 2019. My dictum is talking to you FND and whoever has an attitude or behaviour like yours of blind loyalty even if you are aware that democracy imply something different. If this attitude and behaviour continues Malawi will never change. For our nation to change it is the obligation and prerogative of all citizens and particularly we in civil society to shun deception and dirty money, we need to defy personalization of interests and blind loyalty. We need to realize that Malawi politics is being destroyed and conflicted by politicians, it is our duty and responsibility to deny being bulldozed into submission of stupidity and fallacy. Having said all these I appeal to FND to start looking at political situation with sober eyes and pure mind. Therefore FND is found wanting in asking the vice president and madam Callista Mutharika to return the money they have been paid. If anything President Peter Mutharika must be penalized to answer why he kept Callista Mutharika on the job if she has not been on duty for 4 years. FND is telling us that whoever is against the government of the day is insane and illegal as long as he/she post blind loyalty to the president. That is not the democracy we fought for in 1993 to 1994. DPP know that for 4 years madam Callista Mutharika was not performing her duties why didn’t president Peter Mutharika sack her? Now that she is against his nomination she is a non performer? This is insane of you FND and your paymasters. Sometimes when you are paid to do the despicable, leave the money and follow your conscious. Fellow civil society organizations and citizens of Malawi. This attitude of following individual politics is depriving our nation of the anticipated unity, equity and fair distribution of resources. Instead this attitude is multiplying and increasing the prospects of crime against humanity in corruption and state looting. The time when Malawi transforms to start following the rule of law and good governance, institutions like yours among other political parties will be deregistered. 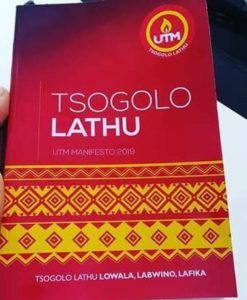 It only shows that you are operating with the intention of promoting and encouraging looting and corruption so that meagre tax payers money keep ending in your hands not for service delivery and development of the country. In closing my dictum let me appeal to all Malawians to follow the path of truth than deception. To stand for justice instead of blind loyalty.